More protests were planned on Wednesday a day after police officers in El Cajon near San Diego shot and killed an unarmed black man, less than two weeks after similar incidents in two other US cities. In the latest incident, two officers responded to calls that an African-American man in his 30s was walking in traffic and "not acting like himself," El Cajon, California, police said. Days earlier, in Charlotte, North Carolina and in Tulsa, Oklahoma, police and shot and killed black men, igniting demonstrations against racial bias in US policing and demands for greater accountability for officers. 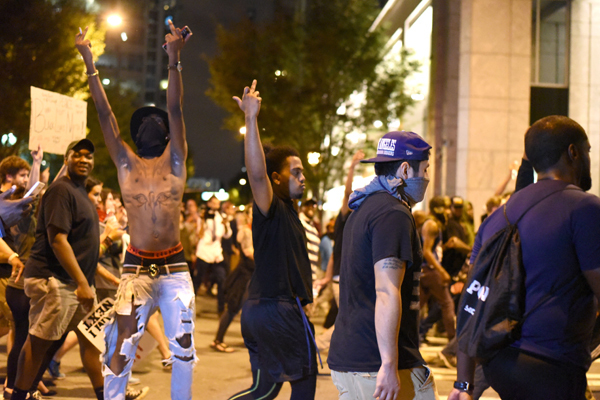 In Charlotte, rioting prompted the authorities to impose a state of emergency and curfew. The El Cajon officers found the man behind a restaurant at about 2 p.m. PDT (2100 GMT) and ordered him to remove his hand from his pocket. After he refused, one officer drew a firearm and the other readied a Taser device, police said. The man paced back and forth as the officers tried to talk to him with their weapons pointed at him, police said. He then pulled an object from his front pants pocket, placed both hands together and extended them toward an officer in "what appeared to be a shooting stance," police said. The officers simultaneously shot and used the Taser on the man, who died after being taken to the hospital, police said. Officials have not identified him. No weapon was found at the scene, El Cajon Police Chief Jeff Davis told reporters. He did not say what the man was pointing. "Now is a time for calm," Davis said. "I implore the community to be patient with us, work with us, look at the facts at hand before making any judgment." The officers were placed on administrative leave, which is standard procedure in such incidents. Demonstrators planned to gather outside the police department on Wednesday to "demand an end to the oppression of black and brown people," said United Against Police Terror, an activist group organizing the event. Some 30 protesters gathered at the scene after the shooting, according to local media. They later marched to the police department, by which time the crowd had swollen to about 100 people, including community leaders, the Los Angeles Times reported. Video emerged on social media purportedly from the moments after the shooting. In the footage, a woman who says she is the victim's sister is heard saying she phoned police. "Oh my God. You killed my brother. I just called for help and ... you killed him," the unidentified woman said, sobbing. A witness voluntarily provided investigators with cell phone video of the incident, police said. Police released a still photo from the video that appeared to show two officers pointing weapons at a man who was aiming an object at them. The San Diego chapter of the American Civil Liberties Union called for a swift and transparent investigation, and they condemned "disturbing" reports that police officers confiscated witnesses' cell phones. The San Diego District Attorney was investigating the shooting, police said. El Cajon, with population of about 100,000 people, is about 15 miles northeast of San Diego.